Apple on Tuesday was awarded a patent covering a futuristic iPhone protection system that can recognize when a phone is dropped, calculate an estimated point of impact and shift its center of gravity to avoid striking sensitive components. The U.S. Patent and Trademark Office officially awarded Apple U.S. Patent No. 8,903,519 for a "Protective mechanism for an electronic device," which looks to safeguard expensive computer hardware from accidental drops, a problem that has become all too familiar with the latest slim iPhone designs. Apple's invention can not only estimate where a device will make impact, but actively shift the unit's center of gravity so that sensitive components like glass screens and cameras are not damaged. As described in the patent text, Apple's system relies on sensors to monitor physical device activity and positioning. Accepted embodiments leverage onboard accelerometers, gyroscopes and GPS which are already incorporated in the latest iPhone and iPad models, while more advanced designs call for ultrasonic sensors, among others. Feeding the data generated by the positioning sensors to a central processing unit enables quick and accurate device positioning determination, specifically as it applies to a state of freefall. When such a scenario is detected, sensors and processor work together to measure speed of descent, time to impact, orientation and other metrics. The processor may then conduct a statistical analysis of the fall by comparing gathered data against embedded information stored in device memory. Once calculations are complete, the system activates a protective mechanism designed to reposition the device in midair so as to impart the least amount of damage to fragile components. The main example uses a motor with eccentric mass able to impart a force on a falling phone's rotational axis, causing it to land on a preferred site, such as its side or back. In practice, an iPhone's vibration motor is sufficient to change the angular momentum of an iPhone spinning in freefall. Depending on the rate of spin, angular velocity, time to impact and other factors, the vibration motor may be powered at higher rotational speeds than normal, effectively controlling momentum and ultimately landing angle. 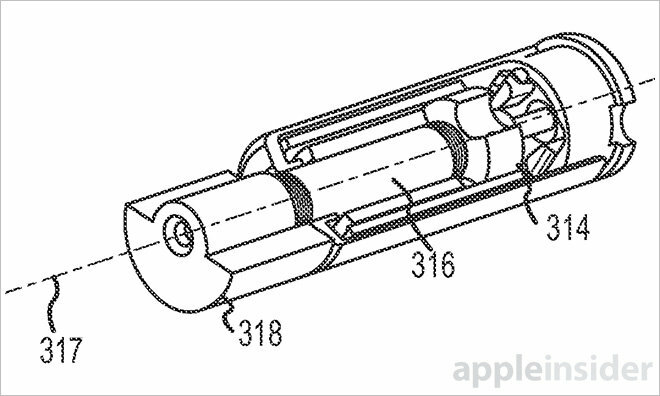 While Apple's most recent iPhone 6 and 6 Plus incorporate bespoke linear oscillating motors that do not use an eccentrically connected rotational mass, previous models did, meaning the patent could easily be worked in to an upcoming variant. More exotic embodiments include internal mechanisms that latch onto or jettison headphone cables in a freefall event, while others involve motors capable of extending and retracting air foils or aerodynamic surfaces for controlled landings. Moving further into the unconventional are miniaturized gas canisters that exert thrust forces to slow down a fall and sliding weights moved along an internal track by linear motors. 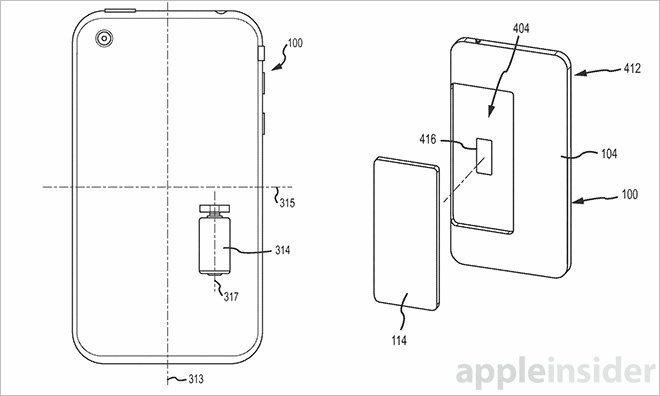 AppleInsider was first to cover Apple's protective mechanism patent applicationin 2013. The official patent as granted credits Nicholas V. King and Fletcher Rothkopf as its inventors.